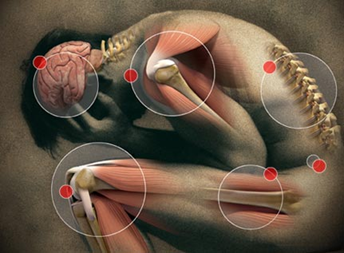 Depressed because of constant pain? Frustrated that nothing you try seems to work? Ready for a drug free approach to dealing with your pain? A professional working with pain patients? Looking for a solution for your clients that is drug free? Ready to learn new techniques you can teach? I found the course to be illuminating on many levels. Intellectually, I was impressed with Maggie's grasp of neurobiology. She provided an intellectual, spiritual, emotional and physical way to understand, address and transform chronic pain. Her materials are well organized. Her lectures are concise and to the point. Having an outline that you can follow is invaluable. While the course is comprehensive, she was encouraging no matter how much or how little you were able to do. I was concerned because I signed up for the course and then didn't have as much time as I envisioned to dedicate myself to the program. However, she made sure that we could access the lectures, and provided comprehensive written and audio materials so that we could work at our own pace. Her material is a gold mine. I know that I have only skimmed the surface. She has given me a roadmap to travel when I am willing to commit to working on managing my pain in a comprehensive way. I developed coping mechanisms that I can utilize when my pain feels like it is getting out of control. Maggie understands that each person is unique and provides a variety of breathing techniques and other approaches and encourages people to chose whatever works for them. I highly recommend her course and written materials. We are delighted to welcome you to a highly effective 3-prong program that can help defeat and even reverse many pain conditions effectively. The Reversing Chronic Pain online program features the most powerful tools I've found in more than 30 years of experience in working with various kinds of emotional and physical pain. 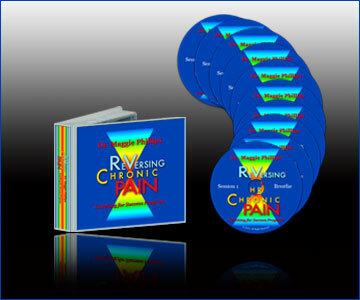 Paired with my book "Reversing Chronic Pain," and adding a library of video and audio aids, many individuals have found unique ways to handle their pain. Most satisfying to me is hearing how the program has brought renewed hope to many who thought they had tried everything in dealing with their pain. Now we are adding a third, empowering new component to the RCP Program! "Maggie Phillip's Pain Coaching Seminars provided such an accessible format for engaging with ideas and suggestions to offer for combating pain. What I valued most was the question and answer format of the seminars provided by the Study Guides; which helped me to organize what I was learning. I can now present coherent factual information about our biology to help my clients to get on board with these exercises which are so effective in dealing with pain. I found the Book "Reversing Chronic Pain" extremely helpful and the coaching took my comfort with the information and exercises to a higher level. Thank you Maggie!" The pain coaching program added to the on line program because it helped me use my preferred learning style better. I learn by hearing and doing better then just reading. By hearing Maggie and getting to ask questions, I could try what I learned with a much better understanding cognitively and emotionally versus what I read and heard. Maggie seems to have a sixth sense about what people in pain are experiencing and also what stages of development we are at in our chronic pain recovery. Maggie gave me the tools to use to empower myself to get out of the bad flares without becoming so anxious and depressed because I am now armed with the tools to take the pain down a few notches where I can handle it. I have found a couple really good tools that work for me in times of trouble,but I had to practice them to get even better. Maggie was able to do the control room with me during one session. That tool is one of the best weapons that I have now to use for all times. The control room is actually a good tool for people without chronic pain to use. It can be used for anxiety and depression and even pregnancy delivery, or recovering from surgery as I am now doing. Thanks Maggie! If you've already purchased the RCP online program, you'll find the pain coaching program is guaranteed to maximize your learning of the techniques you've started practicing. If you haven't yet experienced the online program or book, the pain coaching in itself is a valuable tool to help you get off to a great start in reducing and reversing your pain. I Personally Guarantee Your Satisfaction! We appreciate your investment in our new Pain Coaching program. Take 60 days to review the cds and if you feel this program is not effective for you, we will refund 100% of the cost of the CD program! So you risk nothing – not a single penny. 10 one-hour group coaching sessions on CD. The Reversing Chronic Pain Program offers a much needed and often overlooked aspect in the treatment of pain....education in the understanding of all facets of pain. I feel this is one of the most effective learning tools I've ever seen. I strongly encourage those who have not yet explored the RCP online program to do so – and also take advantage of the great opportunity to purchase the RCP online program in conjunction with the Coaching Program CD set. Stop and think for a moment - you can get more than 10 weeks of support and training to reverse your pain for LESS than it usually costs for one visit to see a health or counseling professional. If you are in pain, we recommend that you use both the Online Program and Coaching CD set to maximize your success. The cost for this dynamic combination is only $114.97. Of course, it's also OK to begin with the online program, or the coaching CD program separately at $74.97 each. If you've already enrolled in the Online program, GREAT! Complete your training and boost your application of techniques by adding the Coaching Program, a set of 10 CDs is only $74.97. YES! I'm ready to take my healing to the next level! Send me the Coaching CD Set only! Maggie's reversing chronic pain coaching program stood up to her usual level of excellence. As a professional counselor and coach who works with people with chronic pain, anxiety and depression, I have used a variety of the wonderful tools she provided in the seminar to assist my clients with a multitude of different issues. Thank you again Maggie for your generous work. Initially, Maggie's pain program really helped me to feel less overwhelmed and hopeless about being able to successfully manage my chronic pain syndromes. After several months of use, I am incorporating her protocols into my everyday life and obtaining significant relief. Per the current FTC guidelines, we are in the process of collecting results data from our customers to be able to define the "typical" or "average" experience of our customers. While we collect that data, we are sharing the photos and comments of individual customers. None of these photos or comments in any way represent the "average" or "typical" customer experience. In fact, as with any product or service, we know that some customers invest in our system but never use it, and therefore get no results from their investment whatsoever. Therefore, the customer stories we are sharing can neither represent nor guarantee the current or future experience of other past, current or future customers. Rather, these customer stories represent what is possible with using our system. Each of these unique stories, and any and all results reported in these stories by individual customers, are the culmination of numerous variables, many of which Reversing Chronic Pain/Maggie Phillips, PHD cannot control, including pricing, target market conditions, product/service quality, offer, customer service, personal initiative, and countless other tangible and intangible factors.